Meet Warren Bobrow, The King of Cannabis Cocktails, Mocktails & Tonics©!! Cannabis Cocktails, Mocktails & Tonics © is a great name for this incredible bible of bud laced beverages by the King of Cannabis Cocktails, Warren Bobrow. Some of you may have heard of him and some may not have. If you enjoy cannabis, then he is one to get to know. He is not someone who decided to mix some drinks with weed. What he did do is create a book of history, direction, philosophy, with a creativity in mixology and a natural approach to spirited drinking using cannabis. Warren is the author of a few other books related to syrups, bitters, whiskey cocktails and more. He has lived a very interesting life after working in the private banking industry for 20 years. Since that time he has been traveling, teaching & writing globally for magazines, cocktail & food blogging, doing restaurant reviews, and attending festivals. He has put all of these experiences together and now presents this wonderful book called Cannabis Cocktails, Mocktails and Tonics, The Art of Spirited Drinks and Buzz-Worthy Libations. This well crafted cannabis cocktail catalog, shows us a different way to consume cannabis without smoking or effecting our surrounding. As the legalities of cannabis continues to be of concern to some of us, we will still need to be discrete in the way we consume cannabis, and coffees, teas, fruit drinks and cocktails are all ways to achieve privacy when indulging. Warren has loaded this book with great information on how to pick your cannabis, prepare your cannabis, strengthen and maximize it with a method called decarbonization. He shows you how, what and when to indulge medically, even ways to gain composure after a little too much. He has covered all the bases with this one. We received our copy of Cannabis Cocktails, Mocktails & Tonics © and was impressed how well put together the hardback collection of 75 cannabis infused drinks and tonic recipes was. At first glance we knew this would be one for the recipe collection for a long time. It was built that way. At LoudBank, we already have this magnetic attraction to cannabis, so this was another monumental moment to learn something new. A change of pace from smoking, dabbing, vaping, the trial and errors of learning those techniques. The thought of chilling with a cannabis based cocktail and nobody knows, was relaxing. Guess whats in my drink? The ever so clear instructions from Warren on how to blend them was comforting. Bringing life back to the bar in the kitchen or basement by introducing new flavors, stocking the bar with cannabis infused preps. adding new garnishes and spices to bring a whole new element to drinking. Cannabis Cocktails, Mocktails and Tonics © is great for the first timers also. Guiding a conscious drinker or beginner mixologist with basic measurements and ingredients to make syrups and creams for a perfect cocktail. Let Cannabis Cocktails, Mocktails and Tonics be the teacher and before you know it your mixing the right strain for the right situation. All of the details and procedures are here, step for step, to make anything from a hangover curing Bloody Good Remedy, (mocktailing the Bloody Mary), to a simple refreshing salty sweet lemonade. 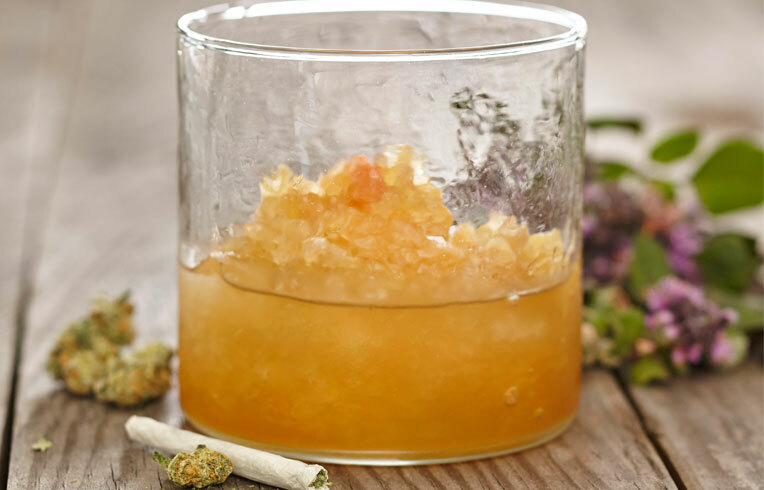 After reading about all the different drinks, coffees, spirits and mocktails we thought it was time time to have our first cannabis infused mocktail. We choose to make the popular and refreshing Mock-Cosmopolitan. With this one, we could put together with a few ingredient already in stock and compare to something we already know. It was enlightening, adding the special medicated rich cannabis infused syrup ingredient, instead of using alcohol. To my surprise it was very good. Just a great combination of balanced refreshing flavors. I am already looking at the book for another cocktail recipe. Beware though, Warren would suggest that you treat these delicious beverages with the same respect you would give any other alcoholic drink. They are very good and just as potent! As we see it, this book of Cannabis Cocktails, Mocktails and Tonics © will be around for ages. You’ll love this book for special occasions, holidays and as a special treat for the 420 friendly guest. Its a must have for those who prefer not to smoke, those who would love to medicate in more social and less offensive manner. Are you ready to try something different? If you love cannabis period, Cannabis Cocktails, Mocktails and Tonics is great book to start or add to you recipe collection. Our rating is based on good instructions, good recipes, being well written, a solid hardback, and how much a benefit to all medical and recreational cannabis users. Text reprinted with permission, c/o Fair Winds Press, an imprint of Quarto Publishing Group. Infuse the whiskey with the cannabis following the instructions on page 34. Place the pitted cherries in a large mason jar, then cover with the infused whiskey. Store the jar in a cool, dark place, such as a cellar or refrigerator, for 1 month, shaking the jar daily. Don’t be afraid to store these outside the fridge at cellar temperature: nothing bad will happen if you do. Use as called for in cocktails and mocktails. The Dramatis Personae is my Cocktail Whisperer’s riff on the Vieux Carré, the classic New Orleans cocktail. My version calls for belly-friendly Creole bitters, and uses Calvados, or apple brandy, in place of cognac. Sound like an unusual cast of characters? It gets better. Enter a spritz of Infused Absinthe, stage right. Finish the Dramatis Personae by pouring a little Infused Absinthe into an atomizer or spray bottle, and topping the drink with just a whiff of the medicated spirit. When you’re infusing your absinthe, try an Indica strain like Mr. Nice. It’s earthy and sweet, with pungent aromatics that enhance the aniseed and herbal notes in the absinthe. Before you fill your mixing glass with ice, turn it upside down and burn some cannabis under it in order to fill it with smoke. Turn it right side up, and immediately fill it three-quarters full with ice (now you’ve made smoked ice!). Add all the other ingredients except the absinthe, and stir fifty times. Strain into a pre-chilled glass, and finish with a spritz of Infused Absinthe. MORRISTOWN – A Morris County author just released his fourth cocktail book, but this time he’s substituted the bitters for something a little different. Morristown “Cocktail Whisperer” Warren Bobrow’s “Cannabis Cocktails, Mocktails, and Tonics: The Art of Spirited Drinks and Buzz-Worthy Libations” debuted earlier this month, and is a guide to adding marijuana to mixed drinks. Bobrow, 55, said he was partially inspired to create the book by a family background in the pharmaceutical industry. Bobrow, who grew up in Morris Township and went to Morristown-Beard, said he was raised with an emphasis on natural healing. Which is why he enjoys creating cocktails he says have natural healing methods, something he said marijuana can add to a drink. Bobrow said he always planned to write a marijuana-themed cocktail book, as it mixes two things he knows well. A chef with a background in wine and history with marijuana, Bobrow said he has a palate for flavor that makes him the right person to pen this book. Bobrow wrote “Cannabis Cocktails” in about three weeks, taking another month to develop the 75 different cocktail recipes. While the book may create some controversy for its subject matter, Bobrow said edibles like “pot brownies and candies” are much more dangerous than adult cocktails, as they appeal to a younger audience. Bobrow stressed that all of his research and experimenting for the book was done in U.S. locations where marijuana use was permitted. For anyone planning to utilize the book in New Jersey, Bobrow stressed to get a medicinal marijuana card and go through the proper channels. Still, he hopes readers take his work seriously. Two recipes he singled out from his collection were the Thai-Spiced Ginger Beer, made with an ounce of medicated simple honey syrup, and the Mezzrole Cocktail, a bourbon drink that uses half an ounce of cannabis-infused vermouth. The recipes are all his own, and while the cocktails work with all variations of marijuana, specific strains are recommended for each. For the Thai-Spiced Ginger beer, he selected the strain “Tangle,” while he believes the Mezzrole works best with a “Sativa-Indica” hybrid. Bobrow said the book was thoroughly vetted by the legal team of his publisher, Fair Winds Press, before launching June 1. Bobrow said he is working on a fifth cocktail book, which he said will be a compendium of his previous works. Go to http://cocktailwhisperer.com/ to learn more about Bobrow, “Cannabis Cocktails,” and his other books, which are available for purchase online through major booksellers including Amazon and Barnes & Noble.